Big Zeb put in a superb performance to lead home a St Patrick’s Day 1-2 for Ireland in today’s feature Seasons Holidays Queen Mother Champion Chase when storming home six lengths clear of Forpadydeplasterer, winner of last season’s The Irish Independent Arkle Chase. Kappa Champion Hurdle with Brave Inca, and he admitted the victory was not a total surprise. “It’s has been plain to see that he has had his bad days - he has done stupid mistakes - but everything kind of went well this year. We got a little bit of greedy fingers and went to Sandown when we probably shouldn’t have but it’s turned out fine. Everyday we are learning something about him,” said Murphy. “It was the manner that he did it that was so great today, the way that he just tracked down the hill. “Everything went right for him today and he jumped very well. We’ve been learning all year about him but he’s a proper horse now. It was always going to be difficult last year as a second-season novice taking on older horses but I think coming here last year helped him grow up. “In all fairness to Barry (Geraghty), he was very bullish about beating Master Minded at Punhestown last year, and I thought he was a little bit mad. He was dead right and he has struck up a really good relationship with the horse. He takes a bit of knowing but Barry knows him now. “Everyday you are living with the horse, it’s like bread and butter, and it’s unbelievable to have him from day one and do this. 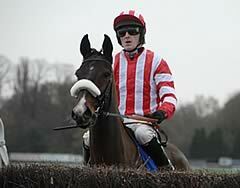 Jockey Barry Geraghty added: “It was great performance. He has jumped well all year - he ran no race at Sandown but other than that he has been very good. He didn’t jump well that day but then he didn’t travel then. “I always knew I had enough horse under me and I that it was going to take a very good one to get by. He had a good look around after the last and I thought that he was going to pull himself up but he found plenty when he needed it. “I knew that Master Minded was coming because I had a peek and saw the sheepskin but I had a lot of horse and kicked for home. “I wouldn’t say he’s as good a horse as Moscow Flyer but today was certainly as good a performance as Moscow put in. Owner Patrick Redmond added: “We always thought that he could do it, that he had a big day in him. He was unlucky here last year but definitely today was his day and we were 100 per cent behind him all the way. Forpadydeplasterer, winner of last year’s Irish Independent Arkle Chase, stepped up to senior level and ran a fine race to finish runner-up in this two-mile championship. Ridden by Tony McCoy who wore the colours of The Goat Syndicate, a Dublin-based group of friends, Forpadydeplasterer is trained by Tom Cooper, who said: “It’s strange, but I’m happy to win and sad to be beaten. He had a very mixed preparation for this but it had nothing to do with today’s defeat. “I would have liked a stronger gallop - I think it made the difference between winning and losing - but the ground was ideal for him. Tony said the faster horse beat us on the day. We wanted a lead and hoped Twist Magic would do that job, but it didn’t work out like that. Kalahari King has become a regular in the winner’s enclosure at The Festival. By finishing third behind surpise winner Big Zeb, the Ferdy Murphy-trained horse made his third visit in three years to the enclosure. With red-hot favourite Master Minded not looking like the winner some way out, connections could have been excused for wishing better than third - Kalahari King was the clear second favourite at 9/2 - but there were no such feelings. “He jumped right which he’s never done before which is a little problem, but it was a great race. I think he ran his race. The ground was fine, there were no excuses at all really. We’ll take him home and see how is and take it from there,” said Murphy. The owners, Neil and Julie Morgan, enthused about their horse’s performance. “How can we be disappointed with a horse that’s just come third in the Champion Chase? If we’d have been offered that at the beginning of the season, we would have taken it. We are absolutely delighted with him, he’s a proper Grade One horse. “You can’t be worrying about what others are doing, when the race is on you’re watching your own horse,” said Neil Morgan. Master Minded failed in his attempt to become only the second three-time winner of the Seasons Holidays Queen Mother Champion Chase with the 4/5 favourite faring no better than fourth. His trainer Paul Nicholls said: “We were beaten fair and square. “I was concerned with the drying ground over the past couple of days and Ruby (Walsh, jockey) said he didn’t let himself down. I could see that too after a couple of fences. He didn’t perform at his best today. “He is a big, heavy horse and on ground like this something just stops him letting himself down. 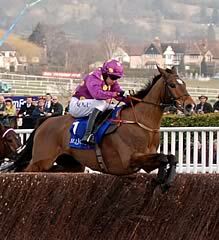 He is a hard horse to train, unlike Kauto Star.